I am watching E TV, they are on the Red Carpet already. I have the tivo going so if I see some thing amazing I can pause it for a second. Not that I can draw anything. I am mostly looking to you for some amazing dresses. I don’t much like Miley Cyrus, but I like that dress. It’s very fantasy-princess, isn’t it? I’m putting it away in my head to use for another time–I like the scale-shaped layers. I’ve got my coloured pencils and sketchbook out, as well, but I’m not livedolling. I’m watching Poirot. Not meaning to spam the comments or anything, but what the heck is with this random one-shoulder-strap style on an otherwise really nice strapless dress? Michelle Obama wore it to the inauguration day parties and I didn’t like it then and I don’t like it now. I like her dress, as well. I think it’s lovely and I like the silver roses (at least, I THINK they’re roses) especially. Except for the whole one-sleeve-thing. I don’t like it. A LOT of people are doing that mermaid skirt… THING. I appreciate a good mermaid skirt, but I think most of the ones I’ve seen tonight (on Vanessa Hudgens and Beyonce) are a little too much. I do like Kate Winslet’s dress with the one strap. And the Grace Kelly hairstyle. She’s such a beautiful and classy woman–she could go to the Oscars in overalls and still look wonderful. Now I know the name of those little glittering sequin all over dresses. I loved that dress, but would have liked some color. Wow, I love the dress Robin Roberts is wearing, what an eye popping color! Wow, that is… a lot of dress Sophia Loren is wearing. Heyyy, Duchess wins for Best Costumes! Like it could be any otther way. I love the blue dress that Freida Pinto is wearing, the close up of the covered arm shows some amazing embroidery work. These are all lovely and I must admit to being very impressed with how fast you can draw. 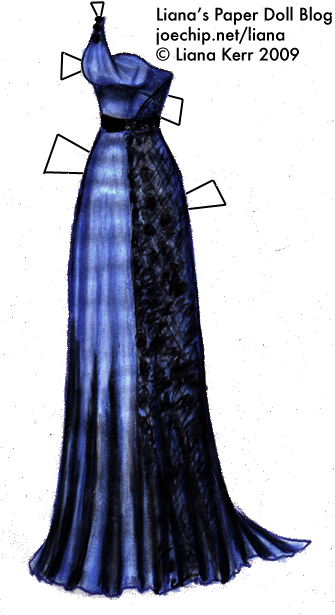 I especially like the lace on the dark blue dress and all the detailing on the white strapless one with the full skirt. I love your choices. I’m not sure what I think of Miley’s dress. While I like it, the skirt is totally something else. I like the shape, but there’s a lot going on there. Hope you’re feeling better Janel! I’ve read some mighty unflattering descriptions of Miley’s gown, but she’s, what, 16? 17? I think it looks more princess-y and less prom-y, I probably would have been all over that when I was that age ;) Julie made a really great observation, though — the skirt is almost exactly like a 1950s Dior gown. 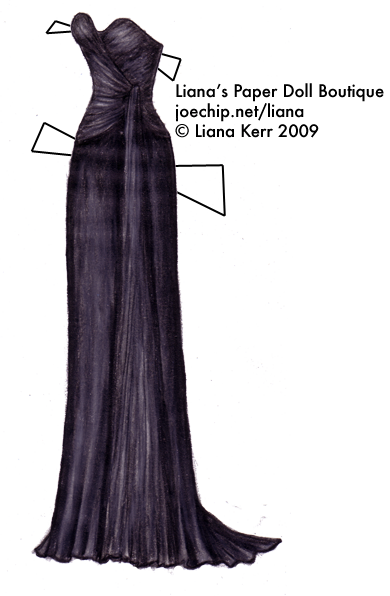 On the Dior gown, though, the sash is more natural (not stiff and decorated), the top is strapless and less matchy-matchy with the skirt, and the skirt itself is less symmetrical, which I think makes it look more romantic and less like a pinecone. i like the miley dress, but i agree that it holds a princess air to it. but it is the oscars the dress are supposed to look impractical. Yeah, it’s kind a shame that everyone’s micromanaged to the nth degree now — no more swan dresses! i just got back from an out of town trip and what a treat to see all the work you have posted since last week! these Oscar dresses as especially fabulous ~ what a fun idea! 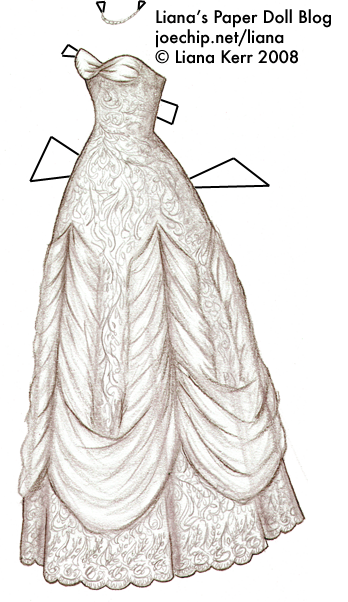 It is so awesome that you thought to do paper doll dresses based on the Awards.